WINDSOR, ON – After an unsuccessful road trip in Ottawa, seeing the team lose to both, Carleton and Ottawa, the Windsor Lancers controlled their home opener with a 78-70 victory over the York Lions. Coach Oliver’s team opened the game playing intensely on both ends of the floor. Rotimi Osuntola Jr.’s powerful play in the first quarter made up for a slow start by leading scorer, Enrico Diloreto. Osuntola Jr. had a big dunk and three-pointer to set the tone for Windsor. The Lancers controlled the boards, collecting 15 rebounds, giving them an early 17-11 lead. Windsor started the second quarter slowly. Though continuing their tough play, they could not seem to convert turnovers into points. Josh Collins and Osuntola Jr. missed several easy lay-ups. York’s poor shooting kept the Lancers in the lead; the Lions only made 3 of 13 shots. Diloreto warmed up in the latter half of the quarter; he ended the frame with a deep three-pointer to give the Lancers a commanding 39-22 lead at the end of the first half. Josh Collins’ defense was on point in the start of the second half; he had three of nine Windsor steals in the quarter but the team continued to struggle scoring off of turnovers. York matched the Lancers’ scoring in the third quarter, through drawing defensive fouls. The Lions were very much in the game entering the final quarter. They had complete momentum in the second half, holding the Lancers to only 12 points in the fourth quarter. Nick Tufegdzich led a York’s comeback but the Lancers pressure defense stopped the Lions from getting a good shoot in the final 30 seconds. Tufegdzich had a monster game of 19 points, 21 rebounds and 2 blocks, but it was not enough for the York Lions. Windsor’s strengths were in their defensive play that caused an alarmingly high 33 turnovers. Their bench also provided great support, scoring 39 points. Lancer forward, Bradford Parker had breakout game coming off the bench. In 20 minutes of play, he showed brilliant moves inside in the paint and a resilient defensive presence. He had 14 points, 8 rebounds (5 offensive), and 2 steals. Look for Head Coach, Chris Oliver to rely on Parker for an instant poise off the bench. 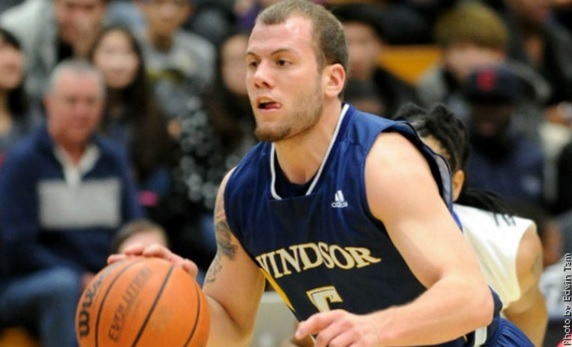 The Windsor Lancers face the Queens Golden Gaels Saturday at 8 PM. The York Lions travel to London, ON to face the Western Mustangs also on Saturday. NPH East Coast Showcase April 26-28 Hosted by Mount Allison!